I love to read biographies of significant people in history. One of my favorite subjects is Abraham Lincoln. In his book about the Great Emancipator, author Thomas Keneally writes how Lincoln was once a great debtor. Most of his indebtedness revolved around purchasing two New Salem (IL) stores with a partner of his, William Berry. The first store was purchased from a former boss of Lincoln’s (Denton Offutt – his first employer as an adult) in 1832. It seems that Lincoln, nor his partner Berry, were too interested in seeing to the success of the business. “For while Lincoln was at one end of the store dispensing political information, Berry at the other was disposing of the firm’s liquors,” wrote Billy Herndon (Lincoln’s former law partner). The following spring, two brothers purchased the stores from the partners – but it seems it wasn’t enough to cover the cost of their promissory notes. Both Lincoln and Berry were broke. To his credit, the soon-to-be-President could have declared bankruptcy. But, he chose to take it on. And to make things worse, Berry passed away two years later which meant that Lincoln was responsible for his share too. Lincoln took on various other jobs to help pay off the debt, including working as a postmaster, cutting rails, surveying, working at the mill and helping out with harvests. He was determined to make things right. But for all his efforts, some notes that he signed to avoid bankruptcy came due for payment in 1834. “Creditors sued, and the sheriff took possession of his horse, bridle, and surveying instruments.” Keneally writes. A friend and farmer, Jimmy Short, stepped in to buy all the goods at auction and returned them to Lincoln. This is a testament to the man in that people tended to see the good in him and the lengths he was going to pay off his debts. People generally believed he would “make good” on his promise to pay. The incident likely made a impact on Lincoln, as his career progressed soonafter. Although his debts were eventually paid off, his marriage to Mary Todd resulted in other money woes – which involved her spending too much on White House functions. It helps to see the humanity in those we look up to. They struggled as many of us have. This gives us hope that if they can do it, we can too. Do you have anything else to add about Lincoln’s indebtedness / money troubles or his life? 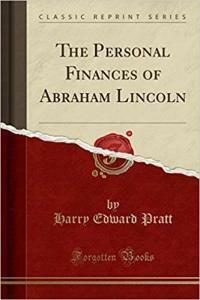 From an Amazon reviewer: This brief summary of personal records and account books of Abraham Lincoln provides accurate and hitherto little known information about the personal finances of our 16th President. Lincoln has not been studied extensively on his personal earnings, investments, family and political expenditures, but this book fills an invaluable gap for scholars. Read how Aaron is keeping his cell phone bill low with Tello Mobile ($11.34/mo that includes 300MB, 200 minutes and unlimited texting). Previous Post Previous Post When Should Kids Own a Cell Phone?